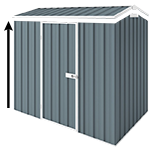 The EasyShed Narrow Slider garden sheds are designed with sliding doors and a narrow build. The EasyShed Narrow Slider garden sheds are designed with sliding doors and a narrow build. This model is wide so it has ample room for storage but still narrow so it can be tucked away in the backyard. Easy glide doors which roll smoothly and do not scrape. Adjustable high-quality rolling wheels, which roll along the inside of the pelmet.